Successfully Added Digital Bracelet Recorder - MP3, 8GB, OLED Display, One-key Playing + Recording to your Shopping Cart. Feel like you’ve been forgetting things recently? Missing deadlines? Always having to go back to the shop to get the items you left off the shopping list? It happens to all of us and it can get very annoying. Luckily, with this digital bracelet recorder, all of this can be a thing of the past. This simple light bracelet can help you record anything you may need throughout the day: notes to yourself, observations, ideas, to-do lists or even lectures at the university. Who knew that a simple bracelet can be an efficient solution to a great deal of problems? Well, it can! 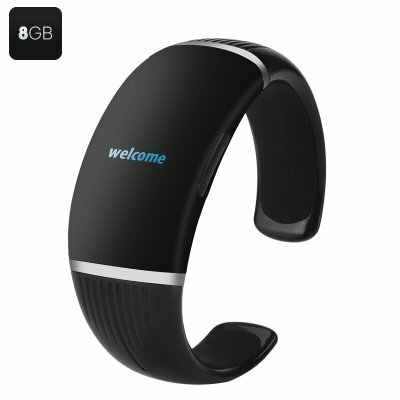 This bracelet doubles as a digital voice recorder and can help you leave messages to yourself whenever you want to. It can store up to 8GB of content and record your messages in MP3 and WMA. With the built-in mic and speaker, you will be able to easily record and instantly listen to your messages when you need them. The bracelet is quick and easy to use. It features a one-key playing and recording, letting you instantly and conveniently operate the small accessory. With up to 23 hours of continuous recording at 32Kbps and fast charging, the bracelet is a great functional gadget to use on the go. The bracelet is compatible with Windows 2000/XP/Vista/7/8/and Android systems. The Digital Bracelet Recorder comes with a 12 months warranty. Brought to you by the leader in electronic devices as well as wholesale digital recorders..